"The colossal misunderstanding of our time is the assumption that insight will work with people who are unmotivated to change. If you want your child, spouse, client or boss to shape up, stay connected while changing yourself, rather than trying to fix them." "A group of clergy came to me from one of the major religious denominations in our society and said, 'We are about to start a project that will raise fifty million dollars for our five hundred most troubled ministers. How would you spend it?' I responded, 'Why would you put fifty million into your most troubled? You will advance your denomination and our society far more if you put it into your five hundred best.' They answered, "But we could never raise the money for that.'" Seriously, I have this book underlined more than just about any I own. 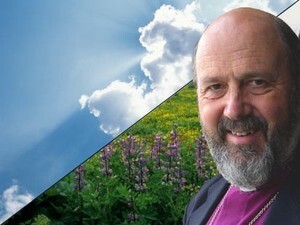 Bishop Tom Wright was interviewed on ABC News a couple of nights back. The video interview gives a good overview of the book's main argument one that is so important that I am rearranging my post-Easter sermons and teaching at the church to take it up. A funeral is not the time to try to change someone’s mind…especially if they are grieving. So, very often the family requests for a funeral service walk the line of liturgical correctness. Want to sing “Happy Trails to You” as the closing song? Well ok.
Want a long video tribute to be the center of the service? Sure. More and more this is what people are doing. Want an “open microphone” sharing time that will be dominated by the most extroverted old fraternity pal who wishes that he was headlining at a comedy club in Las Vegas? (Well, I will try to warn you about this one…but sure, if that’s what you want. All these and many more requests have come in from bereaving families who are trying their best to honor a loved one and find some comfort in the midst of loss. But what is even more touchy is when the sentiments expressed are good-hearted, but theologically wrong-headed. Someone will read a poem that says: “Don’t grieve for me for I am not gone, I am in the flowers, the rain and a song” (or something of the sorts). Or even more subtly, recently I have had a number of people change the name of the service because they really don’t understand what we are doing when we Christians gather to memorialize a loved one. In the Presbyterian Church, the funeral service is actually called “The Service of Witness to the Resurrection.” But most folks have lost an connection between the Resurrection of Jesus and the ultimate hope for all believers (1 Corinthians 15 notwithstanding). And because of this, we have turned memorial services into little more than an old fashioned Irish wake (without the whiskey, unfortunately). We tell stories, we cry, we sing songs and then we eat. But since I am between funerals at the moment, let me point out here in way that I never would with a grieving family, that what gets missed is the main point that was the center of the earliest Christians’ belief: “God was going to do for the whole cosmos what he had done for Jesus at Easter.” (N.T. Wright, Surprised by Hope, p. 93). And that connection between Jesus’ resurrection and the ultimate hope for all of creation is our Christian hope, the fulfillment of that which is usually proclaimed in the reading of the New Testament in every funeral: “But we do not want you to be uninformed, brothers and sisters about those who have died, so that you may not grieve as others do who have no hope. For since we believe that Jesus died and rose again, even so, through Jesus, God will bring with him those who have died.” 1 Thessalonians 4:13-14. This is understandable to me. It’s easier to think of a loved one being freed from a body filled with cancer than to actually think of that body renewed to a new incorruptible life. In the same way, it is easier for more of us to imagine (in a John-Lennon-like way) an existence of being unified with the universe, or being angelic and “spiritual” than to consider what a “new heaven and new earth” (Revelation 21) would be. But that is exactly the hope that we have both in a Christian funeral and in living every day. It’s obvious to me that funeral sentiments have become the practical working theology of most people today. And in a desire to find comfort that we believe is only possible “somewhere in the great by and by” we are losing the hope—and the calling--that is ours in the here and now—in our bodies. “God’s people are promised a new type of bodily existence, the fulfillment and redemption of our present bodily life.” Wright, Hope, p. 147. "Our task in the present... is to live as resurrection people in between Easter and the final day, with our Christian life, corporate and individual, in both worship and mission, as a sign of the first and foretaste of the second. Eleven years ago, when I was interviewing for the position I currently hold, there came a moment in the discussion when the committee wanted to know my view of scripture. I understood that I was wading into pretty deep theological waters with a group of people who truly wanted their pastor to affirm the terra firma of a solid, biblical and unwaveringly, conservative faith. While Presbyterian, this was an "Evangelical" church with a capital "E", and they were on the look out especially for closet "liberals". I look upon interviews, less as auditions, then as rehearsals. I wanted them to experience me as their pastor and how I want to uphold the Scriptures as the authoritative ground of our beliefs as well as the challenging prophetic, often earth-shaking voice of God that can transform everything we think we know with the sheer power of a Divine Word. So, when asked about my view of scripture, I asked them a question in return: "If I could prove to you from the Scriptures, that the Bible teaches that homosexuality is a valid lifestyle and gift of God for Christians, would you as leaders publicly declare it so?" They gulped. They gasped and I think a couple of them rolled their eyes. As I said, this is a conservative evangelical bunch. They believe that homosexuality is a sin. And now, I was a Presbyterian pastor who was suggesting their worst nightmare. Now, why do I use this illustration to introduce N.T. Wright's newest and perhaps finest book (You heard it here first, this will be CT's Book of the Year) when he never once mentions homosexuality? Because the key issue of faith in most of our theological discussions is not an ethical issue (no matter how controversial) but the authority and interpretation of the Scriptures in a post-Christian world. And very often even the most devout Christians hold views that need to be revisited in light of the Scriptures and reconsidered again. In this book, Bishop Tom takes on the popular and "popular Christian" views of heaven and hell, the resurrection, and the Kingdom of God and baldly declares that most of what we say, sing and especially affirm in our funerals is biblically left wanting. And this may indeed make many of us gulp, gasp and shake our heads. But hopefully, if we affirm that we are "people of the Book", it will also take us back into the Scriptures with humility and a teachable spirit. Last year, after reading Wright's larger tomes on the subject I offered three lectures on the subject of "Life after Death and What Comes After That". After the first lecture (where I offered the same classical Christian views that Wright teaches far more ably), I had a retired Presbyterian pastor who had performed over 1000 funerals tell me that he now realized that he had never learned what the Scriptures teach (and what up until very recently the church universally affirmed) to be true of the "dead in Christ" and that all of these years he had been...well...wrong. Of course, this was hard for him to admit (as it has been when I look back at things I have said or written that have needed correction). But the pastor was a humble, teachable man, who held and taught his church one clear conviction: The Scriptures are our authority and if we are proved wrong by the Scriptures then we will always seek to be corrected and live rightly. 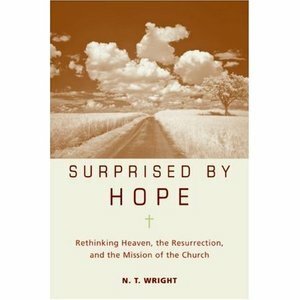 What Wright does superbly is recovers classic Christianity and wipes the dust of culture, biases and syncretistic worldviews that often passes for theological thought away so that we can allow the faith of the earliest Christians to lead, teach and change us. What he also does, is demonstrates the huge, practical impact of thinking biblically. Over the next few weeks, I'll share some excerpts and reflections from the book. But in the meantime, I encourage you to give yourself an early Easter present and reconsider what resurrection...and the ultimate hope we have in Christ...really is. My Thanksgiving gift to my small cadre of readers is to recommend a book that has been a gift to me. 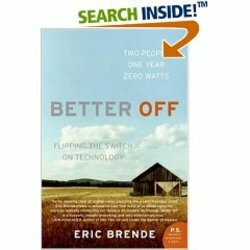 It is a book called Better Off by Eric Brende. Brende graduated from MIT and then spent eighteen months with his new bride living in a community of people who even the Amish think are quaint and backward. They had no technology, not even running water and electricity. His goal was to determine the amount of technology that actually enhances life. The irony of writing a recommendation of a book questioning the value of technology on my laptop to post on my internet weblog is not lost on me. But this little snippet of Brende’s first experience attending the Anabaptist worship service of his new neighbors (he and his wife are Roman Catholics) and listening to their singing is so worth sharing that I’ll overcome my uneasy conscience, share it with you and pray that God will have mercy on my technologically-addicted Calvinist soul. I’ll have more to say on this topic, I am sure. But for now, I remain thankful that there are some of you who actually read what I write in these posts and that I have a laptop, the internet and other gizmos like my ipod and espresso machine to help me do it. Here’s the quote, enjoy, and please consider getting and reading the book. Happy Thanksgiving. (T)here was a long history behind the music, a history of precarious Anabaptist fortunes among religious enemies. Present company could not escape the memory of their predecessors’ suffering any more than they could ignore their uneasy relationship with the world around them today, a world that challenged them on almost every front. This strange melancholy chant perfectly expressed that discomfiture. The music eerily wavered somewhere between the harmonious and the off-key, yawning over the edge of tonality one minute, circling back for a resolution the next. (They) were not tone deaf. The course they charted among the hazards and temptations of modern society created dissonance. I fell behind in blogging about Becoming a Kingdom Community because I did some "extra" reading last week. I want to offer this review today and will have more to follow. Tomorrow I'll return to the blog series. In my book, It Takes a Church to Raise a Christian, I asked readers to picture themselves at a coffee shop having a conversation about the church, spirituality and our changing culture. I asked readers to consider the mega church “strategists” of our day, those dabbling in different “spiritualities” and frustrated seekers all taking a seat at the table. And I suggested that the faithful teachers of the past (especially John Calvin) be allowed to convene and lead us through this discussion. For me, this metaphor was simply an introduction, a means of framing a theological conversation that would be in every since pretty standard: I wrote a book on how the church needs to be more like God for the believers to become more like Christ. And I left the metaphor of coffee house conversation behind. 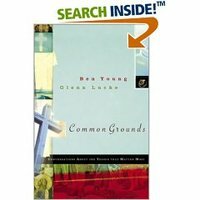 But in their recent book, Common Grounds, Ben Young and Glenn Lucke (see blog here) give us much more than a metaphor, they pull up the chair and let us enter an actual (fictionalized) coffee house conversation between three young professional friends and a wise and winsome Christian professor. One representing a kind of Big Church Evangelicalism, another a Charismatic philosophy student is more interested in spiritual experiences than doctrine or beliefs, and the prime foil, an ex-catholic lawyer who likes to party with her friends and thinks that Christianity is simplistic, close-minded, out-moded, narrow “Neanderthal” religion that has no place in her world. They struggle with an uneven plot and character development and fall into some laughable pitfalls to get the conversation and the dramatic elements to make their points (A lawyer who doesn’t know what “pluralism” is? A romantic “entanglement” between two long-attracted adults that is no more than ONE kiss?) . While the "Neo Series" benefits from the author’s obvious skill as a writer (McClaren does have an M.A. in English), Young and Lucke are at their best in giving us some clear caricatures that will help the conversation along when we get to the meat of the dialogue. But, and this alone makes the book worth recommending, they help frame a conversation that is very helpful in addressing the kinds of objections that are being raised today in a post-modern milieu. Without attacking the church (which McClaren too easily falls into!) or reframing Christian theology in ways that get us arguing with one other, Young and Lucke offer Christians a way of talking about Christianity to seekers that confronts most of our outdated and irrelevant “evidence” approaches to apologetics. The authors help the Christian who is looking to engage skeptical friends with some fresh starting places by giving then a model in the engaging, caring and principled professor. If nothing else, his model of what “speaking the truth in love” could look like in an urban coffee shop with skeptics all around is worth reading the book twice. But if the fiction is less than stellar, the theological conversation itself is a gift. I doubt if a “skeptic” or “seeker” will read this book or find it helpful, but if more Christians read it and start reframing the way we talk about Christianity these days, maybe more and more skeptics and seekers would be able to see the real “common ground” that all of us—because we are human—share. I was asked by our Senior Ministry to recommend some books for a new "book club" at our church. Honestly, I probably should have said "no." The books I read can range in both orthodoxy and content as I enjoy being challenged by what I read. These are all books that I have found worth passing on to friends but may make a few people wonder about their pastor. I thought an even dozen was a good start. The Stories are just that. You'll have to "bring your own faith" to them and see what they do for you. The Teachings are some of my most trusted writers in the faith, but I don't agree with every one on everything. So, read, talk and pray. The conversation could be communion enough. Salvation on Sand Mountain, Dennis Covington. A gripping true story of how a journalist comes face to face with his need for faith through a most unorthodox group of believers. My Name is Asher Lev, Chaim Potok. A classic story about a boy torn between his passion for art and the Hasidic Jewish faith of his family. The Great Divorce, C. S. Lewis. A famous allegory about heaven and hell. Glittering Images, Susan Howatch. The first story in Howatch’s “Church of England” Series, this book points to the true power in the clay pots that are most clergy. The Brothers K, David James Duncan. An epic story of one family from the Eisenhower years to Vietnam. Kooky and inspiring all at once. Harry Potter (any and all six of them), J.K. Rowling. These are really good stories about good and evil and make interesting grist for the mill, especially for talking with kids. The Teachings: Meant to challenge and comfort, convict and inspire. The Challenge of Jesus: Rediscovering who Jesus Was and Is, N. T. Wright. The best book on Jesus for a wide audience by the best Jesus scholar in the world today. Mere Christianity, C. S. Lewis. A classic introduction to Christianity. It is both an apologetic and an explanation of classic Christian faith. The Way of the Heart, Henri Nouwen. A brief, insightful introduction to desert spirituality and the disciplines of solitude, silence and the prayer of the heart. Dare to Be True: Living in the Freedom of Complete Honesty, Mark D. Roberts. Using the teachings of the Scriptures, this book instructs in how to speak and live the truth in every day situations. This book explores the great divide between Christians who deeply believe the Bible but show little regard for the Creation that the Bible teaches us to care for. The Case for Faith, by Lee Strobel. A "journalistic" look at the objections to Christianity. Part of a larger series of "Case for..." books. I received an encouraging email from Ricky Ray Taylor, a reader of my most recent book, Showtime: Living Down Hypocrisy by Living out the Faith. Ricky graciously gave me permission to post his letter. I am an avid reader with a complete library of just about every book I've read since graduating college in 1992... Rarely do I deem to take the time to fully comprehend what I read in order for it to drastically affect my life. Being relatively "new" in discovering the Power of God in my life - the sub-title of your book - "LIVING DOWN HYPOCRISY BY LIVING OUT THE FAITH" -caught my eye. Here is why: Since being saved in '96, it has truly been a process of growth - not change - but growth... YET, the changing of my outward appearances was still a slow process. I've outlined and highlighted just about all of it. I feel as though I was led to this book because it fit so perfectly into a life of someone who was 'on the fence' towards living a Christian life yet, was still hesitant to bring it to fruition. Rather than "hiding" so many of my references to my "walk" as a Christian - I have now put them at the forefront of my presence. I used to HIDE my signs of being a Christian because since I stepped out of line so often, I was scared of being labeled a HYPOCRITE. This accusation by onlookers would have been rightly substantiated. I "felt" it as much as I wanted to "be" it - but the fear of having others witness my shortcomings made me keep my mouth shut. This made it easy for me to sin without being labeled a hypocrite. I finally decided that I did not want to live like that anymore. I am a CHRISTIAN and for the rest of my life I will STAND AS ONE no matter who watches or who cares or HOW I may be judged. By doing so, I am propelled and MOTIVATED to live a more Godly life and am obsessed in letting others know! Last issue, Christianity Today magazine, featured a quote from It Takes a Church to Raise a Christian: How the Community of God transforms lives. It is now on their website here along with some other quotes about the Lord's Supper.